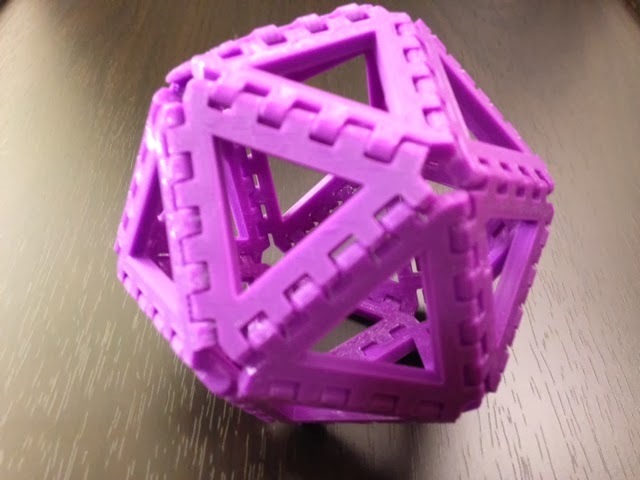 The final Platonic solid in the set of models we entered into the MakerBot Academy Math Manipulatives Challenge was the icosahedron. Settings: MakerWare .3mm/low on a Replicator 2 in two and a half hours. Technical notes: This is the hardest hinged net in the set to print, because it takes up so much of the build platform; I often have trouble with prints of models that go too far into one of the corners. Stuff you might want to change: This particular model is a bit loose, so you might want to make the edge snaps a bit tighter if you want a sturdy model. On the other hand if you like being able to easily push the model between net form and 3D form, then the looseness might be an advantage for you.